However organizations choose to interpret the meaning behind digital transformation, there is at least one thing that appears consistent: it’s got business decision makers thinking about their integration middleware. Caton said that the high numbers garnered from the survey were surprising. However, it is not surprising that more organizations are looking to the cloud. As such, he said the industry should prepare to witness a paradigm shift in how organizations manage their software infrastructure. However, while the cloud appears to be a popular destination, the report also found that 30% of organizations are still considering on-premises middleware management services. It makes sense that there are plenty of security-conscious organizations out there — financial institutions and the like — who no doubt prefer the on-premises approach. Still, it seems a little surprising that organizations would actually plan a middleware migration to another on-premises system as part of their so-called digital transformation. Why are organizations making the switch? The survey found that many IT departments feel pressure to keep integration costs down while the number of integrations that need to occur between increasingly disparate applications and data sources grows. With compliance and security also a growing concern, for many this means shifting from DIY approaches like iPaaS to leveraging managed services like Red Hat’s JBoss platform, Oracle’s Fusion platform or Liason’s ALLOY platform. 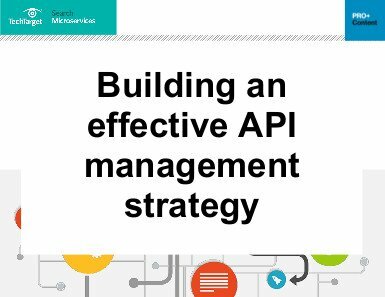 This is certainly not the first we at SearchMicroservices.com have heard of organizations feeling the pressure to ditch their old application middleware, not just in favor of the cloud but also in favor of API-centric approaches. And it’s not just about keeping internal applications integrated; experts have been talking about the need for organizations to consider API-based approaches for B2B data integration as well. But as organizations think about changing their middleware technology, they should also think about how that middleware ultimately fits into their application infrastructure. Specifically, organizations should think about how to keep middleware from becoming an application performance bottleneck. They should also think critically about who should be in charge of that middleware if an organization chooses to manage it themselves. What do you think about the changing middleware landscape, or digital transformation in general? Let us know with your comments. A survey conducted by the software company BiZZ design and The Open Group has revealed that while businesses are eager to jump into a digital transformation, they may not necessarily be happy with the software support available to make that transition happen.It also found that business culture is often a major inhibitor to business transformation. @claudiadilbeck -- A good point with the statement about business culture. In fact, in many cases it may be THE inhibitor. It seems, in a lot of cases, that if the culture shift happens, the technology solutions will follow (as opposed to the other way around).